Dencio’s Kamayan in Davao City has become synonymous with tasty, affordable Filipino food. Our family restaurant started at the back of a mall in 1998 and quickly grew from word-of-mouth. Since then, Dencio’s Kamayan has become part of the dining experience of locals and visitors. We pride ourselves in serving great Filipino and grilled food at affordable prices. Our restaurants are homey and service is attentive. The signature Chicken Barbecue, Pork Barbecue, and Grilled Spare Ribs combine the local preference for sweet and salty flavors. 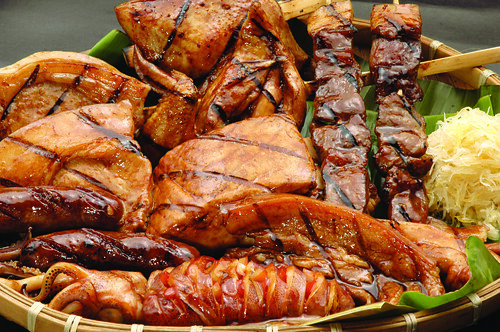 Big groups can enjoy the Ribs Espesyal or Sari-Sari Espesyal, a platter of various grilled meat items. Seafood, abundant in Davao City, is not to be missed. Local specialties are Grilled Panga (tuna jaw), Sizzling Bangus Belly, Grilled Squid, and Grilled Tiyan ng Isda (tuna belly). Other Filipino favorites are the sinful Crispy Pata (deep fried pork leg) and hearty kare-kare, a stew made from peanut sauce with vegetables, oxtail, and beef. Come visit us at any of our branches in Davao, Tagum, and General Santos cities. We will be happy to serve you.